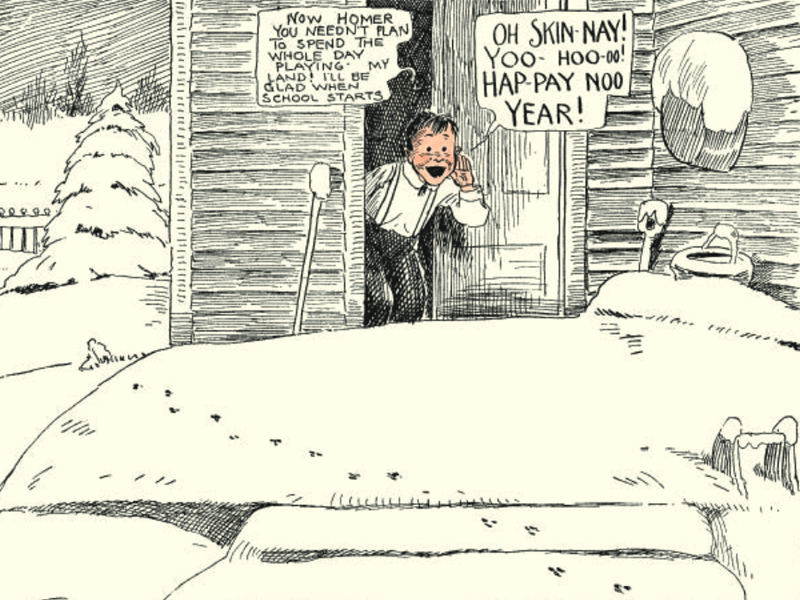 Geroge Herriman and his Krazy Kat are usually discussed without a problem, but so should a lot of other early cartoonist who draw – and spell – in slapstick. 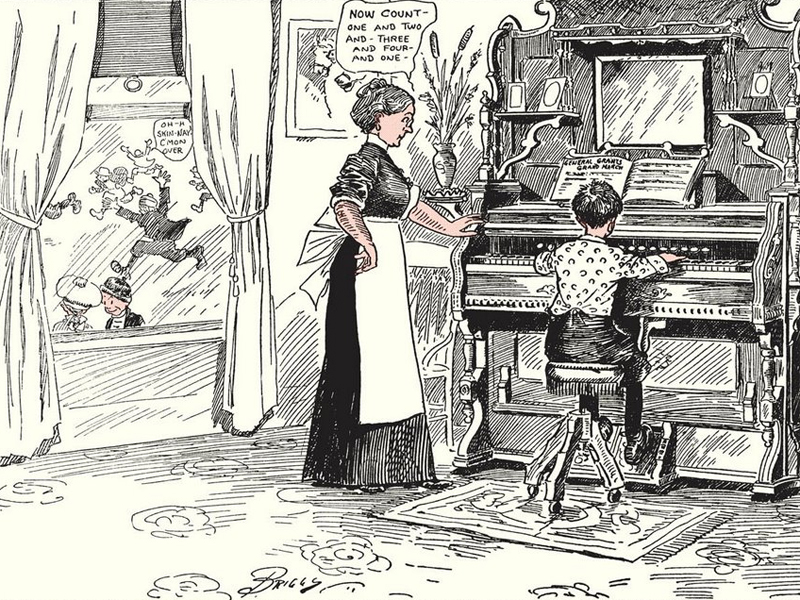 Slapstick as a genre is almost always pinned to vaudeville acts and then the films that sprang from that theatrical traditional, but what – I say – What about physical comedy in comics or literary works great, cult, pop or all the the above? Furthermore, how does the use of language in them portrayal of the corporeal? The picture and text, taken from Drawn & Quarterly’s pdf preview of their recent re-release, is quieter than a lot of other prints in the book but has all that’s needed to flesh out its unique narrative qualities. Even though this is a bucolic scene – wooden house and paw prints – the scene is about two things: 1. the desire to have fun at all times, and 2. wanting to play outside immediately. So this is both a universal and the particular point of view that all children can relate to. Nearly every frame in the the book – in film theory terms – is the the P.O.V. of Skin-nay character who is rarely shown. All the other kids in his town are always shouting his name, hollering for him to come outside because he’s always preoccupied or not allowed to come out for some often unspecified reason. The point is Skin-nay is not there, which makes his P.O.V. psychological and not realist. All of these peaceful, pastoral scenes then are either the vision of someone who imagines that this is what’s happening when he hears someone call out his name (though that element too seems to add a level to the fantasy theory). 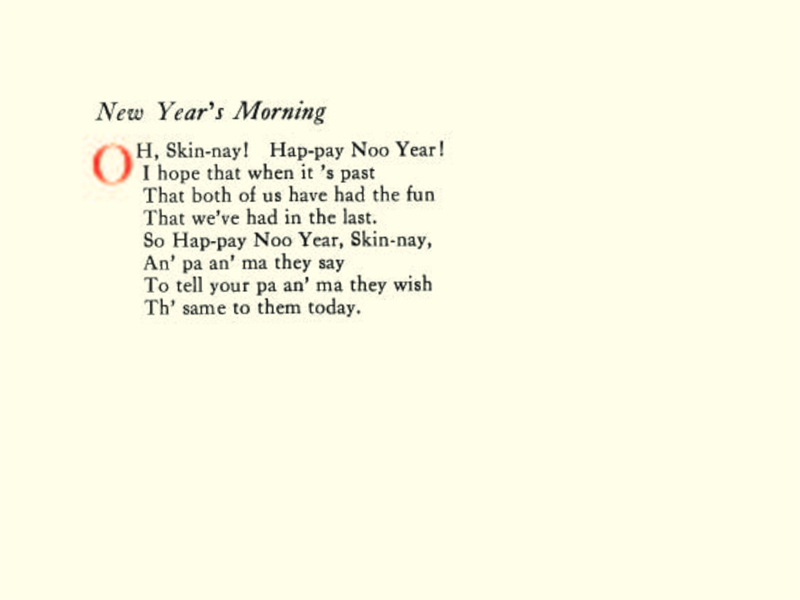 Or this is some wonderful event for all the children of this small, early twentieth century mid-western town, except for Skin-nay, who we must conclude is going (something like) absolutely mad. These are drawings of fantastic (literally: of a fantasy) fun. Is there a better definition for slapstick? Slapstick is not always about performance, but it is usually about seeing the impossible in the real.